Would you like to get all the advantages of feature-rich shopping cart and powerful CMS (Content Management System)? Just imagine this combination of advanced eCommerce functions and easy content management. You can add products, images, options, news, articles. Attract your customers with fancy design and professional content. All this can sky-rocket your sales. Already want it? Then consider integration of OpenCart and Joomla! OpenCart is an open source solution that is known for its high speed and user-friendly interface. It is also less resource-consuming than other platforms. OpenCart shopping cart has MVC (Model View Controller) architecture that makes customization and integration with modules very straightforward process. Design. As they say: the sky is the limit. A big number of templates for OpenCart are at your service. Moreover, template editor will help you to customize any theme you like in any way you like. Products. an unlimited number of items to sell and support of all product types (physical or virtual) can satisfy any business’ needs. Languages. Almost 20 default languages are available. However, almost each and every language can be added with one of free extensions. So, your business won’t feel any inconveniences if you decide to go abroad. Tax, Payment, Shipping. Indeed 3 in 1. Virtually all taxation, paying and shipping options can be set with OpenCart. That is another advantage of the platform that will be vital if you are going to sell internationally. Multi-Store. Top-end function that may be useful for middle and large scale business. It allows you to establish several different stores and manage them via one administrative area. You will be able to set different design, prices and localisation options for each shop. Extensions. There are a lot more default functions that are available with OpenCart like guest checkout, business reports and order management systems. However, even more features can be added with more than 5 000 of different OpenCart extensions that can be easily integrated with the platform. It is one of the most popular CMS in the world. It currently powers nearly 2.8% of all Internet sites. Joomla became so popular because it can help you build a professional website from scratch with only basic skills in programming. 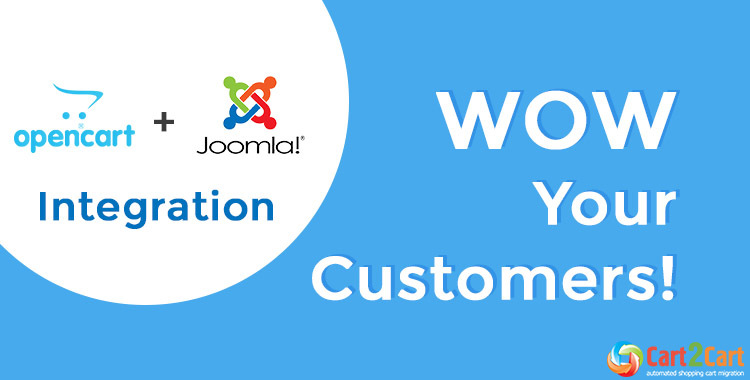 Joomla allows you to add, manage and modify any type of content you would like. Since it is open source and uses MVC architecture Joomla is easy to modify and customize. Additionally, more than 9 000 of extensions can help you built your site the way you like. What are the OpenCart platform integration options? So, what is the best way to make OpenCart platform integration with Joomla simple and effective? Currently, there are two options that you may consider. The first one is a complicated way of tailoring a shopping cart and CMS on your own. It will require advanced PHP programming skills and time. As a result, you may or may not get what you wanted. An alternative way is to use already existing Joomla shopping cart that combines both Joomla and OpenCart features. In this case you may consider three platforms: JooCart, AceShop and MijoShop. Each of them include the strongest sides of both shopping cart and CMS but has some peculiarities that you need to consider. For instance, which versions are integrated and what extensions can be used. Undoubtedly OpenCart + Joomla combination can increase your sales and profit. But what to do when your store is already built with another shopping cart? It’s simple! Try Cart2Cart - an automated data migration service. You will be able to transfer all your data effortlessly from Magento to OpenCart, as well as from PrestaShop to OpenCart and Zen Cart to OpenCart , not to mention 70+ other shopping carts. It is quick, easy to perform and secure. Launch our absolutely Free Demo migration to transfer a number of entities like products, categories, customers, orders, reviews, manufacturers, etc to evaluate your future store and test the service.